This was a delicious accident. 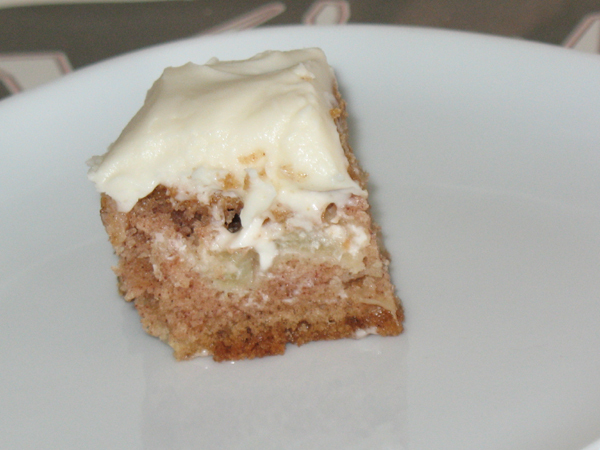 It was supposed to be my first carrot cake, but instead became my first apple cake, with cream cheese frosting. Back in November I purchased Betty Crocker Baking Basics – recipes and tips to bake with confidence, which is available on Amazon.com and Amazon.ca. It’s been a very useful book. I planned to make the carrot cake recipe but didn’t have any carrots, so I went to the store, and was promptly distracted by the shiny apple display. I came home and emptied my shopping bag, perplexed with what to do with a bag of Granny Smith apples and cream cheese. This cake is perfectly delicious without frosting at all, however if you intend to frost this, take the cream cheese out of the fridge now. After frosting cake must be refrigerated. Let frosting set before cutting. Step 1 – preheat oven to 176°C / 350°F, centre rack. Grease and flour baking pan. 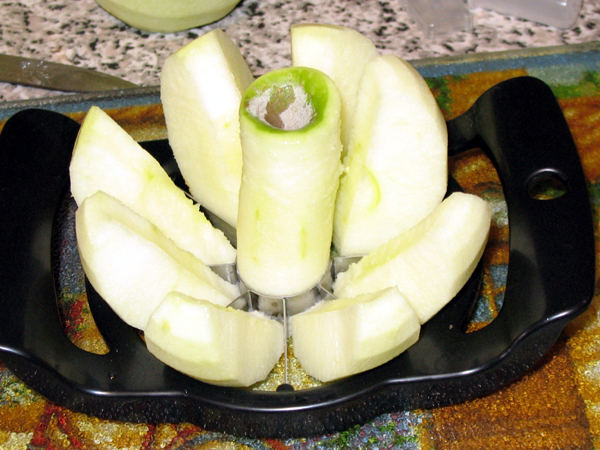 Step 2 – peel apples, core apples, and dice into small pieces. Set aside. 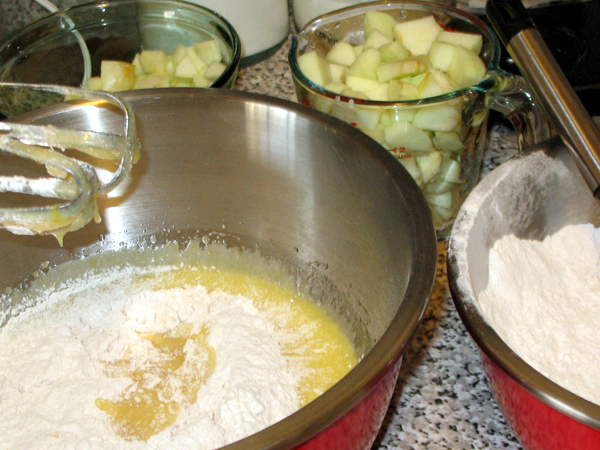 Step 3 – in medium bowl combine: flour, cinnamon, nutmeg, baking soda, and salt. Set aside. 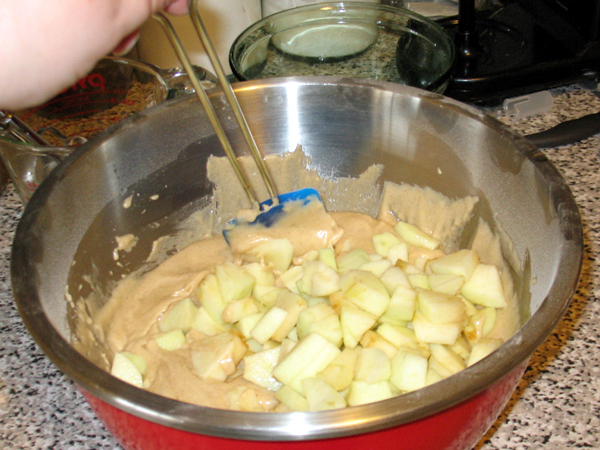 Step 4 – in large bowl, beat on Low for 30 seconds: sugar, oil, vanilla, and eggs. 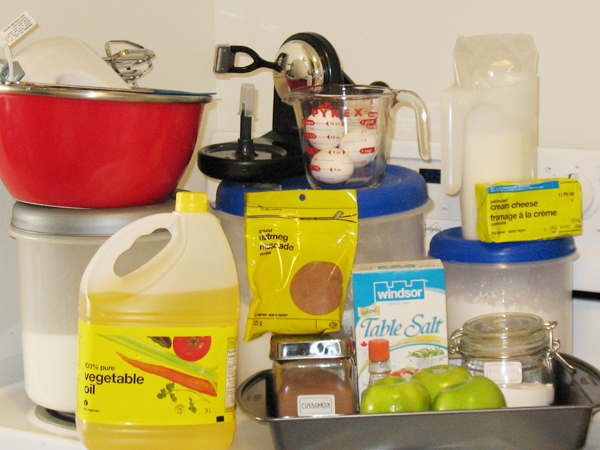 Step 5 – beat dry ingredients into wet, adding a third at a time until blended. Once all dry mixture is added, beat on Low for 1 min, frequently scraping the sides. 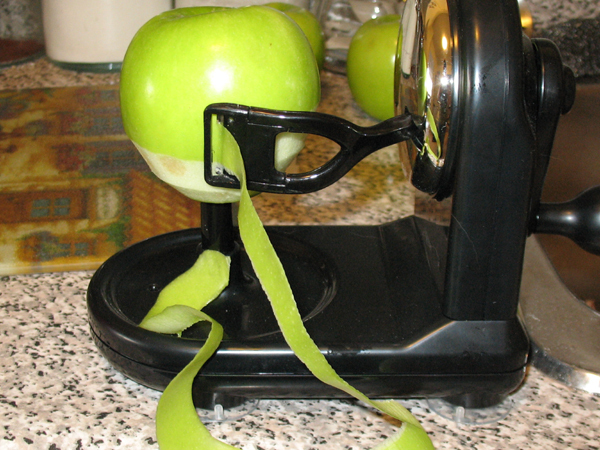 Step 7 – “pour” (hah!) batter in greased pan, use spatula to smooth batter down. Shake pan and let it settle for a few minutes, then place in oven. Step 8 – bake 40-45 min, it’s done when toothpick inserted in the centre comes out clean. Cool cake in pan, on rack, at least 1 hour. Step 9 – remove cake from pan and make your frosting. In medium bowl on High, beat the cream cheese until smooth. Add butter, milk, vanilla, and beat on Low until smooth. Still on Low, beat in icing sugar, one cup at a time, until mixture is smooth and spreadable. Store frosted cake in fridge, covered. Let frosting set before cutting cake. Oops. 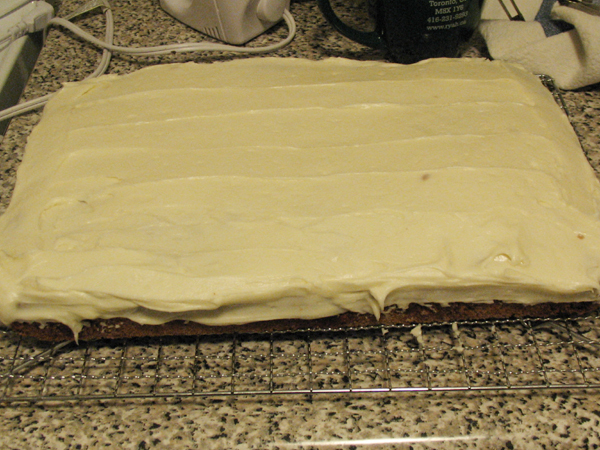 You can’t tell, but before frosting this I cut off a piece to try the cake on its own. Yum. Verdict: I loved this. Boyfriend’s reaction was lukewarm. 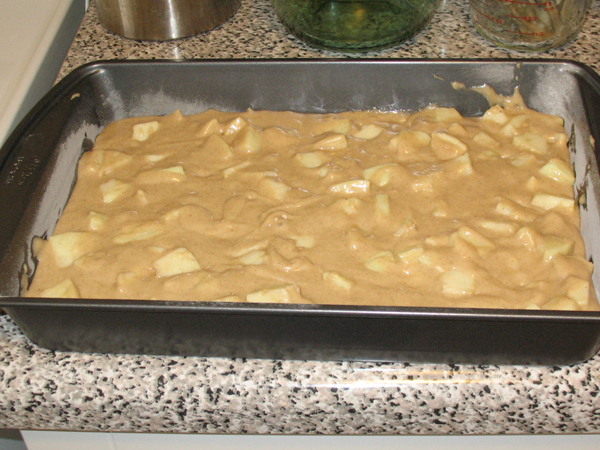 Two things I’ll change next time; use apple sauce instead of vegetable oil, and instead of frosting the cake after it cools, I’m going to make the frosting and put it in the fridge, and just frost pieces as they are served because storing a frosted cake in the fridge was irritating. My favourite part of making this dessert was that while baking, it perfumed my whole home with spiced apple goodness. 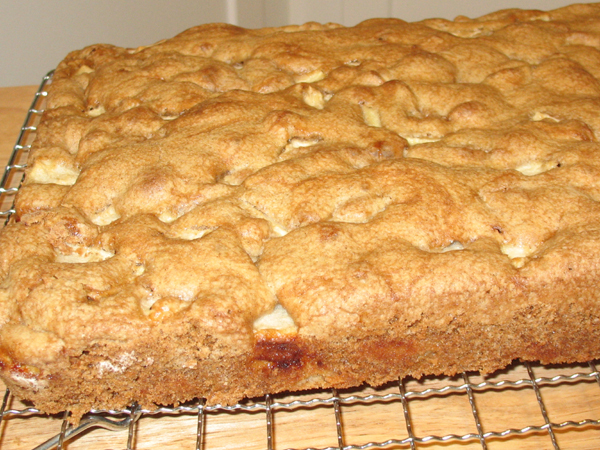 This entry was posted in cakes & cupcakes and tagged accident, apple cake, apples, books, cinnamon, cream cheese, nutmeg.